Happy Wednesday! I'm playing along with the Simon Says Stamp Seeing Stars Challenge today. I was making this card for a sweet little girl and it fit this theme well. To create this card I did some ink blending on some watercolor paper and gold embossed the stars. I cut the panel with some wonky rectangle dies and then cut the finished panel along with some blue cardstock at the same time so the window opening would fit. 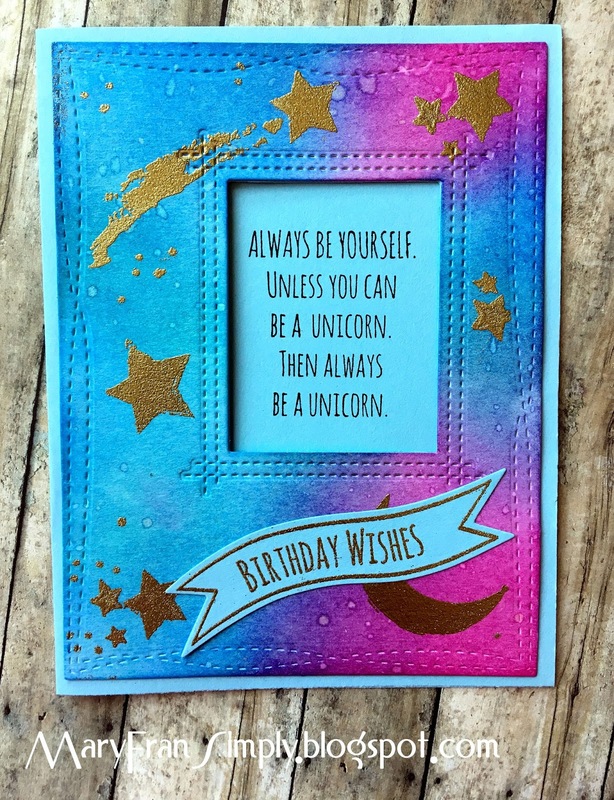 I gold embossed an adorable unicorn, and will show that picture as soon as my camera cooperates. I also stamped and embossed the birthday greeting banner and adhered with some glue dots. The supplies are listed below.